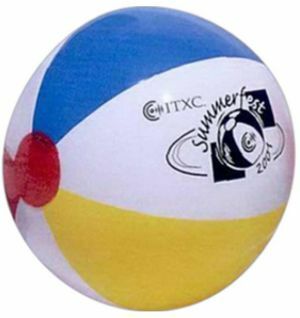 Our promotional 48" beachballs can be customized with a logo or design for your event. This is the largest size of beachballs available on our site. Hurry, order custom beachballs and receive them shortly. Our fast production time, reasonable prices and great quality is the real deal! Available in multi-color, these custom beachballs will give a unique identity to your brand. Promotion Choice's largest sized branded beach balls can be pumped up to 48 inches in size and can bring about an amazing impact to the view at beach, parks, concerts and other outdoor celebrations and events. The custom printed 48" beachballs have become fascination for kids of all ages. These inflated printed beachalls are attention hogs for any event or celebration and promises to increase the enjoyment and attraction for everyone involved. Your attendees, no matter who they are, will adore these giveaways. This size beachball will not only popularize your brand name, but also create an impact on any audience. The imprint area on our 48” balls are so large, they will be visible from a huge distance. Apart from casual events, these 48 inch beachballs adds more joyous spark to birthday celebrations, weddings, baby showers, concerts, and various other events. The set-up price for custom 48" beachballs is low and the turnaround time is very quick. Making your event a success by providing you with quality beachballs in bulk at cheap prices is our responsibility. Contact our customer service hotline today and we will be happy to help you with any questions you may have. Don’t wait, order these campaign beachballs today.